Biography*: John of Brienne (c. 1170 – 27 March 1237), also known as John I, was King of Jerusalem from 1210 to 1225 and Latin Emperor of Constantinople from 1229 to 1237. He was the youngest son of Erard II of Brienne, a wealthy nobleman in Champagne. John, originally destined for an ecclesiastical career, became a knight and owned small estates in Champagne around 1200. After the death of his brother, Walter III, he ruled the County of Brienne on behalf of his minor nephew Walter IV (who lived in southern Italy). The barons of the Kingdom of Jerusalem proposed that John marry their queen, Maria. With the consent of Philip II of France and Pope Innocent III, he left France for the Holy Land and married the queen; the couple were crowned in 1210. After Maria's death in 1212 John administered the kingdom as regent for their infant daughter, Isabella II; an influential lord, John of Ibelin, attempted to depose him. John was a leader of the Fifth Crusade. Although his claim of supreme command of the crusader army was never unanimously acknowledged, his right to rule Damietta (in Egypt) was confirmed shortly after the town fell to the crusaders in 1219. He claimed the Armenian Kingdom of Cilicia on behalf of his second wife, Stephanie, in 1220. After Stephanie and their infant son died that year, John returned to Egypt. The Fifth Crusade ended in failure (including the recovery of Damietta by the Egyptians) in 1221. John was the first king of Jerusalem to visit Europe (Italy, France, England, León, Castile and Germany) to seek assistance for the Holy Land. He gave his daughter in marriage to Holy Roman Emperor Frederick II in 1225, and Frederick ended John's rule of the Kingdom of Jerusalem. Although the popes tried to persuade Frederick to restore the kingdom to John, the Jerusalemite barons regarded Frederick as their lawful ruler. John administered papal domains in Tuscany, became the podestà of Perugia and was a commander of Pope Gregory IX's army during Gregory's war against Frederick in 1228 and 1229. He was elected emperor in 1229 as the senior co-ruler (with Baldwin II) of the Latin Empire, and was crowned in Constantinople in 1231. John III Vatatzes, Emperor of Nicaea, and Ivan Asen II of Bulgaria occupied the last Latin territories in Thrace and Asia Minor, besieging Constantinople in early 1235. John directed the defence of his capital during the months-long siege, with the besiegers withdrawing only after Geoffrey II of Achaea and united fleets from Italian towns defeated their fleet in 1236. The following year, John died as a Franciscan friar. John was the youngest of the four sons of Erard II, Count of Brienne, and Agnes of Montfaucon. He seemed "exceedingly old ... about 80" to the 14-year-old George Akropolites in 1231; if Akropolites' estimate was correct, John was born around 1150. However, no other 13th-century authors described John as an old man. His father referred to John's brothers as "children" in 1177 and mentioned the tutor of John's oldest brother, Walter III, in 1184; this suggests that John's brothers were born in the late 1160s. Modern historians agree that John was born after 1168, probably during the 1170s. Although his father destined John for a clerical career, according to the late 13th-century Tales of the Minstrel of Reims he "was unwilling". Instead, the minstrel continued, John fled to his maternal uncle at the Clairvaux Abbey. Encouraged by his fellows, he became a knight and earned a reputation in tournaments and fights. Although elements of the Tales of the Minstrel of Reims are apparently invented (for instance, John did not have a maternal uncle in Clairvaux), historian Guy Perry wrote that it may have preserved details of John's life. A church career was not unusual for youngest sons of 12th-century noblemen in France; however, if his father sent John to a monastery he left before reaching the age of taking monastic vows. John "clearly developed the physique that was necessary to fight well" in his youth, because the 13th-century sources Akropolites and Salimbene di Adam emphasize his physical strength. Erard II joined the Third Crusade and died in the Holy Land in 1191. His oldest son, Walter III, succeeded him in Brienne. John was first mentioned in an 1192 (or 1194) charter issued by his brother, indicating that he was a prominent figure in Walter's court. According to a version of Ernoul's chronicle, John participated in a war against Peter II of Courtenay. Although the Tales of the Minstrel of Reims claimed that he was called "John Lackland", according to contemporary charters John held Jessains, Onjon, Trannes and two other villages in the County of Champagne around 1200. In 1201, Theobald III granted him additional estates in Mâcon, Longsols and elsewhere. Theobald's widow, Blanche of Navarre, persuaded John to sell his estate at Mâcon, saying that it was her dower. Walter III of Brienne died in June 1205 while fighting in southern Italy. His widow, Elvira of Sicily, gave birth to a posthumous son, Walter IV, who grew up in Italy. John assumed the title of count of Brienne, and began administering the county on his nephew's behalf in 1205 or 1206. As a leading vassal of the count of Champagne, John frequented the court of Blanche of Navarre (who ruled Champagne during her son's minority). According to a version of Ernoul's chronicle, she loved John "more than any man in the world"; this annoyed Philip II of France. The two versions of Ernoul's chronicle tell different stories about John's ascent to the throne of Jerusalem. According to one version, the leading lords of Jerusalem sent envoys to France in 1208 asking Philip II to select a French nobleman as a husband for their queen, Maria. Taking advantage of the opportunity to rid himself of John, Philip II suggested him. In the other version an unnamed knight encouraged the Jerusalemite lords to select John, who accepted their offer with Philip's consent. John visited Pope Innocent III in Rome. The pope donated 40,000 marks for the defence of the Holy Land, stipulating that John could spend the money only with the consent of the Latin Patriarch of Jerusalem and the grand masters of the Knights Templar and the Knights Hospitaller. John landed at Acre on 13 September 1210; the following day, Patriarch of Jerusalem Albert of Vercelli married him to Queen Maria. John and Maria were crowned in Tyre on 3 October. The truce concluded by Maria's predecessor Aimery and the Ayyubid sultan Al-Adil I had ended by John's arrival. Although Al-Adil was willing to renew it, Jerusalemite lords did not want to sign a new treaty without John's consent. During John and Maria's coronation, Al-Adil's son Al-Mu'azzam Isa pillaged the area around Acre but did not attack the city. After returning to Acre, John raided nearby Muslim settlements in retaliation. Although about 300 French knights accompanied him to the Holy Land, no influential noblemen joined him; they preferred participating in the French Albigensian Crusade or did not see him as sufficiently eminent. John's cousin, Walter of Montbéliard, joined him only after he was expelled from Cyprus. Montbéliard led a naval expedition to Egypt to plunder the Nile Delta. After most of the French crusaders left the Holy Land, John forged a new truce with Al-Adil by the middle of 1211 and sent envoys to Pope Innocent urging him to preach a new crusade. Maria died shortly after giving birth to their daughter, Isabella, in late 1212. Her death triggered a legal dispute, with John of Ibelin (who administered Jerusalem before John's coronation) questioning the widowed king's right to rule. The king sent Raoul of Merencourt, Bishop of Sidon, to Rome for assistance from the Holy See. Pope Innocent confirmed John as lawful ruler of the Holy Land in early 1213, urging the prelates to support him with ecclesiastical sanctions if needed. Most of the Jerusalemite lords remained loyal to the king, acknowledging his right to administer the kingdom on behalf of his infant daughter; John of Ibelin left the Holy Land and settled in Cyprus. The relationship between John of Brienne and Hugh I of Cyprus was tense. Hugh ordered the imprisonment of John's supporters in Cyprus, releasing them only at Pope Innocent's command. During the War of the Antiochene Succession John sided with Bohemond IV of Antioch and the Templars against Raymond-Roupen of Antioch and Leo I, King of Cilician Armenia, who were supported by Hugh and the Hospitallers. However, John sent only 50 knights to fight the Armenians in Antiochia in 1213. Leo I concluded a peace treaty with the Knights Templar late that year, and he and John reconciled. John married Leo's oldest daughter, Stephanie (also known as Rita), in 1214 and Stephanie received a dowry of 30,000 bezants. Quarrels among John, Leo I, Hugh I and Bohemond IV are documented by Pope Innocent's letters urging them to reconcile their differences before the Fifth Crusade reached the Holy Land. Pope Innocent proclaimed the Fifth Crusade in 1213, with the "liberation of the Holy Land" (the reconquest of Jerusalem) its principal object. The first crusader troops, commanded by Leopold VI of Austria, landed at Acre in early September 1217. Andrew II of Hungary and his army followed that month, and Hugh I of Cyprus and Bohemond IV of Antioch soon joined the crusaders. However, hundreds of crusaders soon returned to Europe because of a famine following the previous year's poor harvest. A war council was held in the tent of Andrew II, who considered himself the supreme commander of the crusader army. Other leaders, particularly John, did not acknowledge Andrew's leadership. The crusaders raided nearby territory ruled by Al-Adil I for food and fodder, forcing the sultan to retreat in November 1217. In December John besieged the Ayyubid fortress on Mount Tabor, joined only by Bohemond IV of Antioch. He was unable to capture it, which "encouraged the infidel", according to the contemporary Jacques de Vitry. Andrew II decided to return home, leaving the crusaders' camp with Hugh I and Bohemond IV in early 1218. Although military action was suspended after their departure, the crusaders restored fortifications at Caesarea and Atlit. After new troops arrived from the Holy Roman Empire in April, they decided to invade Egypt. They elected John supreme commander, giving him the right to rule the land they would conquer. His leadership was primarily nominal, since he could rarely impose his authority on an army of troops from many countries. The crusaders laid siege to Damietta, on the Nile, in May 1217. Although they seized a strategically-important tower on a nearby island on 24 August, Al-Kamil (who had succeeded Al-Adil I in Egypt) controlled traffic on the Nile. In September, reinforcements commanded by Pope Honorius III's legate Cardinal Pelagius (who considered himself the crusade's supreme commander) arrived from Italy. Egyptian forces attempted a surprise attack on the crusaders' camp on 9 October, but John discovered their movements. He and his retinue attacked and annihilated the Egyptian advance guard, hindering the main force. The crusaders built a floating fortress on the Nile near Damietta, but a storm blew it near the Egyptian camp. The Egyptians seized the fortress, killing nearly all of its defenders. Only two soldiers survived the attack; they were accused of cowardice, and John ordered their execution. Taking advantage of the new Italian troops, Cardinal Pelagius began to intervene in strategic decisions. His debates with John angered their troops. The soldiers broke into the Egyptian camp on 29 August 1219 without an order, but they were soon defeated and nearly annihilated. During the ensuing panic, only the cooperation of John, the Templars, the Hospitallers and the noble crusaders prevented the Egyptians from destroying their camp. In late October, Al-Kamil sent messengers to the crusaders offering to restore Jerusalem, Bethlehem and Nazareth to them if they withdrew from Egypt. Although John and the secular lords were willing to accept the sultan's offer, Pelagius and the heads of the military orders resisted; they said that the Moslems could easily recapture the three towns. The crusaders ultimately refused the offer. Al-Kamil tried to send provisions to Damietta across their camp, but his men were captured on 3 November. Two days later, the crusaders stormed into Damietta and seized the town. Pelagius claimed it for the church, but he was forced to acknowledge John's right to administer it (at least temporarily) when John threatened to leave the crusaders' camp. According to John of Joinville, John seized one-third of Damietta's spoils; coins minted there during the following months bore his name. Al-Mu'azzam Isa, Sultan of Damascus, invaded the Kingdom of Jerusalem and pillaged Caesarea before the end of 1219. John's father-in-law, Leo I of Armenia, died several months before the crusaders seized Damietta. He bequeathed his kingdom to his infant daughter, Isabella. John and Raymond-Roupen of Antioch (Leo's nephew) questioned the will's legality, each demanding the Armenian Kingdom of Cilicia for themselves. In a February 1220 letter, Pope Honorius declared John Leo's rightful heir. Saying that he wanted to assert his claim to Cilicia, John left Damietta for the Kingdom of Jerusalem around Easter 1220. Although Al-Mu'azzam Isa's successful campaign the previous year also pressed John to leave Egypt, Jacques de Vitry and other Fifth Crusade chroniclers wrote that he deserted the crusader army. Stephanie died shortly after John's arrival. Contemporary sources accused John of causing her sudden death, claiming that he severely beat her when he heard that she tried to poison his daughter Isabella. Their only son died a few weeks later, ending John's claim to Cilicia. Soon after Pope Honorius learned about the deaths of Stephanie and her son, he declared Raymond-Roupen the lawful ruler of Cilicia and threatened John with excommunication if he fought for his late wife's inheritance. John did not return to the crusaders in Egypt for several months. According to a letter from the prelates in the Holy Land to Philip II of France, lack of funds kept John from leaving his kingdom. Since his nephew Walter IV was approaching the age of majority, John surrendered the County of Brienne in 1221. During John's absence from Egypt, Al-Kamil again offered to restore the Holy Land to the Kingdom of Jerusalem in June 1221; Pelagius refused him. John returned to Egypt and rejoined the crusade on 6 July 1221 at the command of Pope Honorius. The commanders of the crusader army decided to continue the invasion of Egypt, despite (according to Philip d'Aubigny) John's strong opposition. The crusaders approached Mansurah, but the Egyptians imposed a blockade on their camp. Outnumbered, Pelagius agreed to an eight-year truce with Al-Kamil in exchange for Damietta on 28 August. John was among the crusade leaders held hostage by Al-Kamil until the crusader army withdrew from Damietta on 8 September. After the Fifth Crusade ended "in colossal and irremediable failure", John returned to his kingdom. Merchants from Genoa and Pisa soon attacked each other in Acre, destoying a significant portion of the town. According to a Genoese chronicle, John supported the Pisans and the Genoese left Acre for Beirut. John was the first king of Jerusalem to visit Europe, and had decided to seek aid from the Christian powers before he returned from Egypt. He also wanted to find a suitable husband for his daughter, to ensure the survival of Christian rule in the Holy Land. John appointed Odo of Montbéliard as a bailli to administer the Kingdom of Jerusalem in his absence. He left for Italy in October 1222 to attend a conference about a new crusade. At John's request, Pope Honorius declared that all lands conquered during the crusade should be united with the Kingdom of Jerusalem. To plan the military campaign, the pope and Holy Roman Emperor Frederick II met at Ferentino in March 1223; John attended the meeting. He agreed to give his daughter in marriage to Frederick II after the emperor promised that he would allow John to rule the Kingdom of Jerusalem for the rest of his life. John then went to France, although Philip II was annoyed at being excluded from the decision of Isabella's marriage. Matilda I, Countess of Nevers, Erard II of Chacenay, Albert, Abbot of Vauluisant and other local potentates asked John to intervene in their conflicts, indicating that he was esteemed in his homeland. John attended the funeral of Philip II at the Basilica of St Denis in July; Philip bequeathed more than 150,000 marks for the defence of the Holy Land. John then visited England, attempting to mediate a peace treaty between England and France after his return to France. He made a pilgrimage to Santiago de Compostela in March 1224. According to the Latin Chronicle of the Kings of Castile, John went to the Kingdom of León to marry one of the elder daughters of Alfonso IX of León (Sancha or Dulce) because Alfonso had promised him the kingdom "along with her". The marriage could jeopardize the claim of Sancha's and Dulce's half-brother, Ferdinand III of Castile, to León. To protect her son's interests, Ferdinand's mother Berengaria of Castile decided to give her daughter (Berengaria of León) to John in marriage. Although modern historians do not unanimously accept the chronicle's account of John's plan to marry Sancha or Dulce, they agree that the queen of France (Blanche of Castile, Berengaria of Castile's sister) played an important role in convincing John to marry her niece. The marriage of John and Berengaria of León was celebrated in Burgos in May 1224. About three months later, he met Emperor Frederick's son Henry in Metz and visited Henry's guardian, Engelbert, Archbishop of Cologne. From Germany John went to southern Italy, where he persuaded Pope Honorius to allow Emperor Frederick to postpone his crusade for two years. Frederick married John's daughter, Isabella (who had been crowned queen of Jerusalem), on 9 November 1225. John and Frederick's relationship became tense. According to a version of Ernoul's chronicle, John got into a disagreement with his new son-in-law because Frederick seduced a niece of Isabella who was her lady-in-waiting. In the other version of the chronicle John often "chastised and reproved" his son-in-law, who concluded that John wanted to seize the Kingdom of Sicily for his nephew Walter IV of Brienne and tried to murder John (who fled to Rome). Frederick declared that John had lost his claim to the Kingdom of Jerusalem when Isabella married him; he styled himself king of Jerusalem for the first time in December 1225. Balian of Sidon, Simon of Maugastel, Archbishop of Tyre, and the other Jerusalemite lords who had escorted Isabella to Italy acknowledged Frederick as their lawful king. Pope Honorius did not accept Frederick's unilateral act, and continued to regard John as the rightful king of Jerusalem. In an attempt to take advantage of the revived Lombard League (an alliance of northern Italian towns) against Frederick II, John went to Bologna. According to a version of Ernoul's chronicle, he declined an offer by the Lombard League representatives to elect him their king. Even though this account was fabricated, John remained in Bologna for over six months. The dying Pope Honorius appointed John rector of a Patrimony of Saint Peter in Tuscany (part of the Papal States) on 27 January 1227, and urged Frederick II to restore him to the throne of the Kingdom of Jerusalem. Honorius' successor, Gregory IX, confirmed John's position in the Papal States on 5 April and ordered the citizens of Perugia to elect him their podestà. Gregory excommunicated Frederick II on 29 September 1227, accusing him of breaking his oath to lead a crusade to the Holy Land; the emperor had dispatched two fleets to Syria, but a plague forced them to return. His wife Isabella died after giving birth to a son, Conrad, in May 1228. Frederick continued to consider himself king of Jerusalem, in accordance with the precedent set by John during Isabella's minority. The imperial army invaded the Papal States under the command of Rainald of Urslingen in October 1228. Although John defeated the invaders in a series of battles, it took a counter-invasion by another papal army in southern Italy to drive Rainald back to Sulmona. John laid a siege before returning to Perugia in early 1229 to conclude negotiations with envoys of the Latin Empire of Constantinople, who were offering him the imperial crown. The Latin Emperor of Constantinople, Robert I, died in January 1228. His brother Baldwin II succeeded him, but a regent was needed to rule the Latin Empire since Baldwin was ten years old. Ivan Asen II of Bulgaria was willing to accept the regency, but the barons of the Latin Empire suspected that he wanted to unite the Latin Empire with Bulgaria. They offered the imperial crown instead to John, an ally of the Holy See. After months of negotiation, John and the envoys from the Latin Empire signed a treaty in Perugia which was confirmed by Pope Gregory on 9 April 1229. John was elected emperor of the Latin Empire for life as senior co-ruler with Baldwin II, who would marry John's daughter Marie. The treaty also prescribed that although Baldwin would rule the Latin lands in Asia Minor when he was 20 years old, he would become sole emperor only after John's death. John also stipulated that his sons would inherit Epirus and Macedonia, but the two regions still belonged to Emperor of Thessalonica Theodore Doukas. After signing the treaty, John returned to Sulmona. According to the contemporary Matthew Paris, he allowed his soldiers to plunder nearby monasteries to obtain money. John lifted the siege of Sulmona in early 1229 to join Cardinal Pelagius, who launched a campaign against Capua. Frederick II (who had crowned himself king of Jerusalem in the Church of the Holy Sepulchre) returned to Italy, forcing the papal troops to withdraw. John went to France to recruit warriors to accompany him to Constantinople. Pope Gregory did not proclaim John's expedition to the Latin Empire a crusade, but promised papal privileges granted to crusaders to those who joined him. During his stay in France, John was again an intermediary between local potentates and signed a peace treaty between Louis IX of France and Hugh X of Lusignan. He returned to Italy in late 1230. John's envoys signed a treaty with Jacopo Tiepolo, Doge of Venice, who agreed to transport him and his retinue of 500 knights and 5,000 commoners to Constantinople in return for John's confirmation of Venetian possessions and privileges in the Latin Empire. Shortly after John left for Constantinople in August, Pope Gregory acknowledged Frederick II's claim to the Kingdom of Jerusalem. John was crowned emperor in Hagia Sophia in autumn 1231; by then, his territory was limited to Constantinople and its vicinity. The Venetians urged him to wage war against John III Vatatzes, Emperor of Nicaea, who supported a rebellion against their rule in Crete. According to Philippe Mouskes' Rhymed Chronicle, John could make "neither war nor peace"; because he did not invade the Empire of Nicaea, most French knights who accompanied him to Constantinople returned home after his coronation. To strengthen the Latin Empire's financial position, Geoffrey II of Achaea (John's most powerful vassal) gave him an annual subsidy of 30,000 hyperpyra after his coronation. Taking advantage of John III Vatatzes' invasion of Rhodes, John launched a military expedition across the Bosphorus against the Empire of Nicaea in 1233. His three-to-four-month campaign "achieved little, or nothing"; the Latins only seized Pegai, now Biga in Turkey. With John's approval, two Franciscan and two Dominican friars wanted to mediate a truce between the Latin Empire and Nicaea in 1234 but it was never signed. In a letter describing their negotiations, the friars described John as a "pauper" abandoned by his mercenaries. John III Vatatzes and Ivan Asen II concluded a treaty dividing the Latin Empire in early 1235. Vatatzes soon seized the last outposts of the empire in Asia Minor and Gallipoli, and Asen occupied the Latin territories in Thrace. Constantinople was besieged in an effort to persuade the defenders to gather in one place, enabling an invasion elsewhere. Although the besiegers outnumbered the defenders, John repelled all attacks on the town's walls. Mouskes compared him to Hector, Roland, Ogier the Dane and Judas Maccabeus in his Rhymed Chronicle, emphasizing his bravery. A Venetian fleet forced Vatatzes' naval forces to withdraw, but after the Venetians departed for home the Greeks and Bulgarians besieged Constantinople again in November 1235. John sent letters to European monarchs and the pope, pleading for assistance. Since the survival of the Latin Empire was in jeopardy, Pope Gregory urged the crusaders to defend Constantinople instead of the Holy Land. A combined naval force from Venice, Genoa, Pisa and Geoffrey II of Achaea broke through the blockade. Asen soon abandoned his alliance with Vatatzes, who was forced to lift the siege in 1236. According to three 13th-century authors (Matthew Paris, Salimbene di Adam and Bernard of Besse), John became a Franciscan friar before his death. They agree that John's declining health contributed to his conversion, but Bernard also described a recurring vision of an old man urging the emperor to join the Franciscans. Most 13th-century sources suggest that John died between 19 and 23 March 1237, the only Latin emperor to die in Constantinople. According to the Tales of the Minstrel of Reims, he was buried in Hagia Sophia. Perry wrote that John, who died as a Franciscan friar, may have been buried in the Franciscan church dedicated to Saint Francis of Assisi which was built in Galata during his reign. In a third theory, proposed by Giuseppe Gerola, a tomb decorated with the Latin Empire coat of arms in Assisi's Lower Basilica may have been built for John by Walter VI, Count of Brienne. John's first wife (Maria the Marquise, born 1191) was the only child of Isabella I of Jerusalem and her second husband, Conrad of Montferrat. Maria inherited Jerusalem from her mother in 1205. John and Maria's only child, Isabella (also known as Yolanda), was born in late 1212. Stephanie of Armenia became John's second wife in 1214. She was the only daughter of Leo II of Armenia and his first wife, Isabelle (niece of Sibylle, the third wife of Bohemond III of Antioch). Stephanie gave birth to a son in 1220, but she and her son died that year. Biography*: Érard II of Brienne (died 1191) was count of Brienne from 1161 to 1191, and a French general during the Third Crusade, most notably at the Siege of Acre. He was the son of Gautier II, count of Brienne, and Adèle of Baudemont, daughter of Andrew, lord of Baudemont and Agnes of Braine. His paternal grandparents were Erard I, Count of Brienne and Alix de Roucy. During this siege he saw his brother André of Brienne die on 4 October 1189 before being killed himself on 8 February 1191. Erard II's nephew was Erard of Brienne-Ramerupt. Walter III of Brienne (died 1205) count of Brienne and claimant to the throne of Sicily. William of Brienne (died 1199) lord of Pacy-sur-Armançon, married Eustachie of Courtenay, daughter of Peter I of Courtenay and Elisabeth of Courtenay. John of Brienne (1170–1237), king of Jerusalem (1210–1225), then emperor of Constantinople (1231–1237). [S746] Wikipedia, online http://Wikipedia.com, https://en.wikipedia.org/wiki/%C3%89rard_II,_Count_of_Brienne. Biography*: Walter II, Comte de Brienne was the son of Erard I, Comte de Brienne. He married Humbleline (?). He married Adeliz de Baudemont, daughter of Andre de Baudemont, Seigneur de Braine-sur-Vesle.1 He died circa 1158. Biography*: Erard I, Comte de Brienne was the son of Walter I, Comte de Brienne and Eustachie (?). He married Alice, Dame de Ramerupt, daughter of Andre de Roucy, Comte de Ramerupt et d'Arcis-sur-Aube. Richard de Belmeis belonged to an ecclesiastical and secular land-owning dynasty associated with his uncle, Richard de Belmeis I, Bishop of London from 1108 to 1127, He is generally regarded as the brother of Richard Ruffus, who was an archdeacon of Essex, and their father is given as Robert de Belmeis throughout Diana Greenway's edition of Fasti Ecclesiae. However, Eyton, the Shropshire antiquarian and historian, gave the name of Richard's father as Walter in his study of the origins of Lilleshall Abbey, and repeated this in his further work on the Belmeis family and their holdings, including a family tree. This has been accepted by successive editions of the Dictionary of National Biography. Biography*: Stephen V (Hungarian: V. István, Croatian: Stjepan V., Slovak: Štefan V; before 18 October 1239 – 6 August 1272, Csepel Island) was King of Hungary and Croatia between 1270 and 1272, and Duke of Styria from 1258 to 1260. He was the oldest son of King Béla IV and Maria Laskarina. King Béla had his son crowned king at the age of six and appointed him Duke of Slavonia. Still a child, Stephen married Elizabeth, a daughter of a chieftain of the Cumans whom his father settled in the Great Hungarian Plain. King Béla appointed Stephen Duke of Transylvania in 1257 and Duke of Styria in 1258. The local noblemen in Styria, which had been annexed four years before, opposed his rule. Assisted by King Ottokar II of Bohemia, they rebelled and expelled Stephen's troops from most parts of Styria. After Ottokar II routed the united army of Stephen and his father in the Battle of Kressenbrunn on 12 July 1260, Stephen left Styria and returned to Transylvania. Stephen forced his father to cede all the lands of the Kingdom of Hungary to the east of the Danube to him and adopted the title of junior king in 1262. In two years, a civil war broke out between father and son, because Stephen accused Béla of planning to disinherit him. They concluded a peace treaty in 1266, but confidence was never restored between them. Stephen succeeded his father, who died on 3 May 1270, without difficulties, but his sister Anna and his father's closest advisors fled to the Kingdom of Bohemia. Ottokar II invaded Hungary in the spring of 1271, but Stephen routed him. In next summer, a rebellious lord captured and imprisoned Stephen's son, Ladislaus. Shortly thereafter, Stephen unexpectedly fell ill and died. Stephen was the eighth child and first son of King Béla IV of Hungary and his wife, Maria, a daughter of Theodore I Lascaris, Emperor of Nicaea. He was born in 1239. Archbishop Robert of Esztergom baptised him on 18 October. The child, heir apparent from birth, was named after Saint Stephen, the first King of Hungary. Béla and his family, including Stephen, fled to Zagreb after the Mongols had annihilated the royal army in the Battle of Mohi on 11 April 1241. The Mongols crossed the frozen Danube in February 1242 and the royal family ran off as far as the well-fortified Dalmatian town of Trogir. The King and his family returned from Dalmatia after the Mongols unexpectedly withdrew from Hungary in March. A royal charter of 1246 mentions Stephen as "King, and Duke of Slavonia". Apparently, in the previous year, Béla had his son crowned as junior king and endowed with the lands between the river Dráva and the Adriatic Sea, according to historians Gyula Kristó and Ferenc Makk. The seven-year-old Stephen's provinces—Croatia, Dalmatia and Slavonia—were administered by royal governors, known as bans. In a letter addressed to Pope Innocent IV in the late 1240s, Béla IV wrote that "[o]n behalf of Christendom we had our son marry a Cuman girl". The bride was Elizabeth, the daughter of a leader of the Cumans whom Béla had invited to settle in the plains along the river Tisza. Elizabeth had been baptized, but ten Cuman chieftains present at the ceremony nevertheless took their customary oath upon a dog cut into two by a sword. When Stephen attained the age of majority in 1257, his father appointed him Duke of Transylvania. Stephen's rule in Transylvania was short-lived, because his father transferred him to Styria in 1258. Styria had been annexed in 1254, but the local lords rose up in rebellion and expelled Béla IV's governor, Stephen Gutkeled, before Stephen's appointment. Stephen and his father jointly invaded Styria and subdued the rebels. In addition to Styria, Stephen also received two neighboring counties—Vas and Zala—in Hungary from his father. He launched a plundering raid in Carinthia in the spring of 1259, in retaliation of Duke Ulrich III of Carinthia's support of the Styrian rebels. Stephen's rule remained unpopular in Styria. With support from King Ottokar II of Bohemia, the local lords again rebelled. Stephen could preserve only Pettau (present-day Ptuj, Slovenia) and its region. On 25 June 1260, Stephen crossed the river Morava to invade Ottokar's realm. His military force, which consisted of Székely, Romanian and Cuman troops, routed an Austrian army. However, in the decisive Battle of Kressenbrunn King Béla's and Stephen's united army was vanquished on 12 July, primarily because the main forces, which were under King Béla's command, arrived late. Stephen, who commanded the advance guard, barely escaped from the battlefield. The Peace of Vienna, which was signed on 31 March 1261, put an end to the conflict between Hungary and Bohemia, forcing Béla IV to renounce of Styria in favor of Ottokar II. Stephen returned to Transylvania and started to rule it for the second time after 20 August 1260. He and his father jointly invaded Bulgaria and seized Vidin in 1261. His father returned to Hungary, but Stephen continued the campaign alone. He laid siege to Lom on the Danube and advanced as far as Tirnovo in pursuit of Tsar Constantine Tikh of Bulgaria. However, the Tsar succeeded in avoiding any clashes with the invaders and Stephen withdrew his troops from Bulgaria by the end of the year. Stephen's relationship with Béla IV deteriorated in the early 1260s. Stephen's charters reveal his fear of being disinherited and expelled by his father. He also accused some unnamed barons of inciting the old monarch against him. On the other hand, Stephen's charters prove that he made land grants in Bihar, Szatmár, Ugocsa, and other counties which were situated outside Transylvania. Archbishops Philip of Esztergom and Smaragd of Kalocsa undertook to mediate after some clashes occurred between the two kings' partisans in the autumn. According to the Peace of Pressburg, which was concluded around 25 November, Béla IV and his son divided the country and Stephen received the lands to the east of the Danube. When confirming the treaty on 5 December, Stephen also promised that he would not invade Slavonia which had been granted to his younger brother, Béla, by their father. On this occasion, Stephen styled himself "Junior King, Duke of Transylvania and Lord of the Cumans". A Bulgarian nobleman, Despot Jacob Svetoslav sought assistance from Stephen after his domains, which were situated in the regions south of Vidin, were overrun by Byzantine troops in the second half of 1263. Stephen sent reinforcements under the command of Ladislaus II Kán, Voivode of Transylvania to Bulgaria. The Voivode routed the Byzantines and drove them out of Bulgaria. Stephen granted Vidin to Jacob Svetoslav who accepted his suzerainty. The reconciliation of Stephen and his father was only temporary. Stephen confiscated the domains of his mother and sister, Anna—including Beszterce (present-day Bistri?a, Romania) and Füzér—which were located in the lands under his rule. Béla IV's army crossed the Danube under Anna's command after 1 August 1264. She besieged and took Sárospatak and seized Stephen's wife and children. Voivode Ladislaus Kán turned against Stephen and led an army, which consisted of Cuman warriors, to Transylvania. Stephen routed him at the fort of Déva (now Deva, Romania). King Béla's Judge royal, Lawrence arrived at the head of a new army and forced Stephen to retreat to Feketehalom (now Codlea, Romania). The Judge royal lay siege to the fortress, but Stephen's partisans relieved it. Stephen launched a counter-offensive and forced his father's army to retreat. He gained a decisive victory over his father's army in the Battle of Isaszeg in March 1265. The two archbishops mediated a new consolidation between father and son, which confirmed the 1262 division of the country. Béla and Stephen signed the peace treaty in the Convent of the Blessed Virgin on the Rabbits' Island (now Margaret Island in Budapest) on 23 March 1266. During the civil war in Hungary, Stephen's vassal, Despot Jacob Svetoslav submitted himself to Tsar Constantine Tikh of Bulgaria. In the summer of 1266, Stephen invaded Bulgaria, seized Vidin, Pleven and other forts and routed the Bulgarians in five battles. Jacob Svetoslav again accepted Stephen's suzerainty and was reinstalled in Vidin. 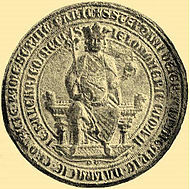 From then on, Stephen used the title "King of Bulgaria" in his charters. Béla and Stephen together confirmed the liberties of the "royal servants", from then on known as noblemen, in 1267. A double marriage alliance between Stephen and King Charles I of Sicily—Stephen's son, Ladislaus married Charles's daughter, Elisabeth, and Charles's namesake son married Stephen's daughter, Mary—strengthened Stephen's international position in 1269. Confidence was never restored between Béla and Stephen. On his deathbed, the old King requested King Ottokar II of Bohemia to give shelter to his daughter Anna and his partisans after his death. The senior King died on 3 May 1270. His daughter, Anna, seized the royal treasury and fled to Bohemia. Henry K?szegi, Nicholas Geregye, and Lawrence Aba—Béla's closest advisors—followed her and handed over K?szeg, Borostyánk? (Bernstein, Austria) and their other castles along the western borders to Ottokar II. Instead of leaving Hungary, Nicholas Hahót garrisoned Styrian soldiers in his fort at Pölöske, and made plundering raids against the nearby villages. Stephen nominated his own partisans to the highest offices; for instance, Joachim Gutkeled became Ban of Slavonia, and Matthew Csák was appointed Voivode of Transylvania. Stephen granted Esztergom County to Archbishop Philip who crowned him king in Esztergom on or after 17 May. The Polish chronicler Jan D?ugosz writes that Stephen made "a pilgrimage to the tomb of St. Stanis?aw" in Cracow and visited his brother-in-law, Boleslaw the Chaste, Duke of Cracow at the end of August. The two monarchs renewed "the old alliance between Hungary and Poland" and entered into an alliance "to have the same friends and the same enemies". Stephen also met Ottokar II on an island of the Danube near Pressburg (present-day Bratislava, Slovakia), but they only concluded a truce. Stephen launched a plundering raid into Austria around 21 December. King Ottokar invaded the lands north of the Danube in April 1271 and captured a number of fortresses, including Dévény (now Devín, Slovakia), Pressburg and Nagyszombat (present-day Trnava, Slovakia). Ottokar routed Stephen at Pressburg on 9 May, and at Mosonmagyaróvár on 15 May, but Stephen won the decisive battle on the Rábca River on 21 May. Ottokar withdrew from Hungary and Stephen chased his troops as far as Vienna. The two kings' envoys reached an agreement in Pressburg on 2 July. According to their treaty, Stephen promised that he would not assist Ottokar's opponents in Carinthia, and Ottokar renounced the castles he and his partisans held in Hungary. The Hungarians soon recaptured K?szeg, Borostyánk? and other fortresses along the western border of Hungary. According to the Life of Stephen's saintly sister, Margaret, who had died on 18 May 1270, Stephen was present when the first miracle attributed to her occurred on the first anniversary of her death. Stephen, in fact, initiated Margaret's canonization at the Holy See in 1271. In the same year, Stephen granted town privileges to the citizens of Gyor. He also confirmed the liberties of the Saxon "guests" in the Szepesség region (present-day Spiš, Slovakia), contributing to the development of their autonomous community. On the other hand, Stephen protected the Archbishop of Esztergom's rights against the conditional nobles of the archbishopric who attempted to get rid of their obligations. Ban Joachim Gutkeled kidnapped Stephen's ten-year-old son and heir, Ladislaus and imprisoned him in the castle of Koprivnica in the summer of 1272. Stephen besieged the fortress, but could not capture it. Stephen fell ill and was taken to the Csepel Island. He died on 6 August 1272. Stephen was buried near to the tomb of his sister, Margaret, in the Monastery of the Blessed Virgin on Rabbits' Island. Stephen's wife, Elizabeth was born around 1239, according to historian Gyula Kristó. A charter of her father-in-law, Béla IV, refers to one Seyhan, a Cuman chieftain as his kinsman, implying that Seyhan was Elizabeth's father. Stephen's first child by Elizabeth, Catherine was born around 1256. She was given in marriage to Stephen Dragutin, the elder son and heir of King Stephen Uroš I of Serbia, in about 1268. Her sister, Mary was born around 1257 and married the future Charles II of Naples in 1270. Their grandson, Charles became King of Hungary in the first decade of the 14th century. According to historian Gyula Kristó, Stephen's third (unnamed) daughter was the wife of Despot Jacob Svetoslav. Stephen's third (or fourth) daughter, Elizabeth, who was born in about 1260, became a Dominican nun in the Monastery of the Blessed Virgin on Rabbits' Island. She was appointed prioress in 1277, but her brother, Ladislaus, kidnapped and married her to a Czech baron, Zavis of Falkenstein, in 1288. Stephen's youngest daughter, Anna, was born in about 1260. She married Andronikos Palaiologos, son and heir of the Byzantine Emperor, Michael VIII. Biography*: Béla IV (1206 – 3 May 1270) was King of Hungary and Croatia between 1235 and 1270, and Duke of Styria from 1254 to 1258. Being the oldest son of King Andrew II, he was crowned upon the initiative of a group of influential noblemen in his father's lifetime in 1214. His father, who strongly opposed Béla's coronation, refused to give him a province to rule until 1220. In this year, Béla was appointed Duke of Slavonia, also with jurisdiction in Croatia and Dalmatia. Around the same time, Béla married Maria, a daughter of Theodore I Laskaris, Emperor of Nicaea. From 1226, he governed Transylvania with the title Duke. He supported Christian missions among the pagan Cumans who dwelled in the plains to the east of his province. Some Cuman chieftains acknowledged his suzerainty and he adopted the title of King of Cumania in 1233. King Andrew died on 21 September 1235 and Béla succeeded him. He attempted to restore royal authority, which had diminished under his father. For this purpose, he revised his predecessors' land grants and reclaimed former royal estates, causing discontent among the noblemen and the prelates. He set up a defensive alliance against the Mongols, which included Daniil Romanovich, Prince of Halych, Boleslaw the Chaste, Duke of Cracow and other Ruthenian and Polish princes. His allies supported him in occupying the Duchy of Styria in 1254, but it was lost to King Ottokar II of Bohemia six years later. During Béla's reign, a wide buffer zone—which included Bosnia, Barancs (Branicevo, Serbia) and other newly conquered regions—was established along the southern frontier of Hungary in the 1250s. Béla separated from his wife in the first half of 1222 upon his father's demand. However, Pope Honorius refused to declare the marriage illegal. Béla accepted the Pope's decision and took refuge in Austria from his father's anger. He returned, together with his wife, only after the prelates had in the first half of 1223 persuaded his father to forgive him. Having returned to his Duchy of Slavonia, Béla launched a campaign against Domald of Sidraga, a rebellious Dalmatian nobleman, and captured Domald's fortress at Klis. Domald's domains were confiscated and distributed among his rivals, the Šubici, who had supported Béla during the siege. Béla invaded Bulgaria and besieged Vidin in 1228 or 1232, but he could not capture the fortress. Around the same time, he set up a new border province, the Banate of Szörény (Severin, Romania), in the lands between the Carpathians and the Lower Danube. In a token of his suzerainty in the lands east of the Carpathians, Béla adopted the title "King of Cumania" in 1233. Béla sponsored the mission of Friar Julian and three other Dominican monks who decided to visit the descendants of the Hungarians who had centuries earlier remained in Magna Hungaria, the Hungarians' legendary homeland. Preparation for a new Mongol invasion was the central concern of Béla's policy. In a letter of 1247 to Pope Innocent IV, Béla announced his plan to strengthen the Danube—the "river of confrontations"—with new forts. He abandoned the ancient royal prerogative to build and own castles, promoting the erection of nearly 100 new fortresses by the end of his reign. These fortresses included a new castle Béla had built at Nagysáros (Velký Šariš, Slovakia), and another castle Béla and his wife had built at Visegrád. Béla appointed his son-in-law, Rostislav Mikhailovich Ban of Macsó (Macva, Serbia) in 1254. Rostislav's task was the creation of a buffer zone along the southern borders. He occupied Bosnia already in the year of his appointment and forced Tzar Michael Asen I of Bulgaria to cede Belgrade and Barancs (Branicevo, Serbia) in 1255. Béla adopted the title of King of Bulgaria, but he only used it occasionally in the subsequent years. The relationship between father and son remained tense. Stephen seized his mother's and sister's estates which were situated in his realm to the east of the Danube. Béla's army under the command of Princess Anna crossed the Danube in the summer of 1264. She occupied Sárospatak and captured Stephen's wife and children. A detachment of the royal army, under the command of Béla's Judge royal Lawrence forced Stephen to retreat as far as the fortress at Feketehalom (Codlea, Romania) in the easternmost corner of Transylvania. The king-junior's partisans relieved the castle and he started a counter-attack in the autumn. In the decisive Battle of Isaszeg, he routed his father's army in March 1265. Biography*: Andrew II (Hungarian: II. András, Croatian: Andrija II., Slovak: Ondrej II; c. 1177 – 21 September 1235), also known as Andrew of Jerusalem, was King of Hungary and Croatia between 1205 and 1235. He ruled the Principality of Halych from 1188 until 1189/1190, and again between 1208/1209 and 1210. He was the younger son of Béla III of Hungary, who entrusted him with the administration of the newly conquered Principality of Halych in 1188. Andrew's rule was unpopular, and the boyars (or noblemen) expelled him. Béla III willed property and money to Andrew, obliging him to lead a crusade to the Holy Land. Instead, Andrew forced his elder brother, King Emeric of Hungary, to cede Croatia and Dalmatia as an appanage to him in 1197. The following year, Andrew occupied Hum. Despite the fact that Andrew did not stop conspiring against Emeric, the dying king made Andrew guardian of his son, Ladislaus III, in 1204. After the premature death of Ladislaus, Andrew ascended the throne in 1205. According to historian László Kontler, "[i]t was amidst the socio-political turmoil during [Andrew's] reign that the relations, arrangements, institutional framework and social categories that arose under Stephen I, started to disintegrate in the higher echelons of society" in Hungary. Andrew introduced a new grants policy, the so-called "new institutions", giving away money and royal estates to his partisans despite the loss of royal revenues. He was the first Hungarian monarch to adopt the title of "King of Halych and Lodomeria". He waged at least a dozen wars to seize the two Rus' principalities, but the local boyars and neighboring princes prevented him from conquering the principalities. He participated in the Fifth Crusade to the Holy Land in 1217–1218, but the crusade was a failure. When the servientes regis, or "royal servants", rose up, Andrew was forced to issue the Golden Bull of 1222, confirming their privileges. This led to the rise of the nobility in the Kingdom of Hungary. His Diploma Andreanum of 1224 listed the liberties of the Transylvanian Saxon community. The employment of Jews and Muslims to administer the royal revenues led him into conflict with the Holy See and the Hungarian prelates. Andrew pledged to respect the privileges of the clergymen and to dismiss his non-Christian officials in 1233, but he never fulfilled the latter promise. Andrew's first wife, Gertrude of Merania, was murdered in 1213, because her blatant favoritism towards her German kinsmen and courtiers stirred up discontent among the native lords. The veneration of their daughter, Elizabeth of Hungary, was confirmed by the Holy See during Andrew's lifetime. After Andrew's death, his sons, Béla and Coloman, accused his third wife, Beatrice d'Este, of adultery and never considered her son, Stephen, to be a legitimate son of Andrew. Andrew's first wife, Gertrude of Merania, was born around 1185, according to historian Gyula Kristó. Their first child, Mary, was born in 1203 or 1204. She became the wife of Ivan Asen II of Bulgaria. Andrew's eldest son, Béla, was born in 1206. He later succeeded his father as king. Béla's younger sister, Elisabeth, was born in 1207. She married Louis IV, Landgrave of Thuringia. She died in 1231 and was canonized during Andrew's life. Andrew's second son, Coloman, was born in 1208. His third son, Andrew, was born around 1210. Coloman and Andrew each ruled the Principality of Halych for a short period. Biography*: Béla III (Hungarian: III. 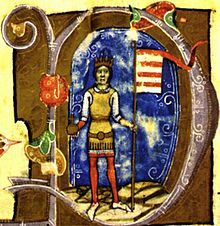 Béla, Croatian: Bela III, Slovak: Belo III; c. 1148 – 23 April 1196) was King of Hungary and Croatia between 1172 and 1196. He was the second son of King Géza II and Géza's wife, Euphrosyne of Kiev. Around 1161, Euphrosyne granted Béla a duchy, which included Croatia, central Dalmatia and possibly Sirmium. In accordance with a peace treaty between his elder brother, Stephen III, who succeeded their father in 1162, and the Byzantine Emperor Manuel I Komnenos, Béla moved to Constantinople in 1163. He was renamed to Alexios, and the emperor granted him the newly created senior court title of despotes. He was betrothed to the Emperor's daughter, Maria. Béla's patrimony caused armed conflicts between the Byzantine Empire and the Kingdom of Hungary between 1164 and 1167, because Stephen III attempted to hinder the Byzantines from taking control of Croatia, Dalmatia and Sirmium. Béla-Alexios, who was designated as Emperor Manuel's heir in 1165, took part in three Byzantine campaigns against Hungary. His betrothal to the emperor's daughter was dissolved after her brother, Alexios, was born in 1169. The emperor deprived Béla of his high title, granting him the inferior rank of kaisar. Stephen III died on 4 March 1172, and Béla decided to return to Hungary. Before his departure, he pledged that he would never make war against the Byzantine Empire. Although the Hungarian prelates and lords unanimously proclaimed Béla king, Lucas, Archbishop of Esztergom opposed his coronation because of Béla's alleged simony. Finally, the Archbishop of Kalocsa crowned him king on 18 January 1173, with Pope Alexander III's approval. Béla fought with his younger brother, Géza, whom he held in captivity for more than a decade. Taking advantage of the internal conflicts in the Byzantine Empire after Emperor Manuel's death, Béla reoccupied Croatia, Dalmatia and Sirmium between 1180 and 1181. He occupied the Principality of Halych in 1188, but it was lost within two years. Béla promoted the use of written records during his reign. 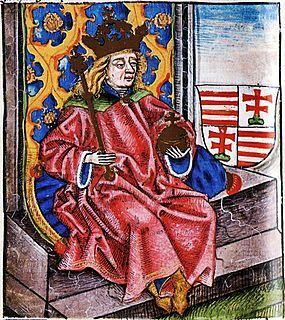 Hungarian chronicles from the 14th century even state that he was responsible for the establishment of the Royal Chancery. The royal palace built in Esztergom during his reign was the first example of Gothic architecture in Central Europe. He was the wealthiest European monarch of his time, according to a list of his revenues, but the reliability of the list is questioned. Biography*: Gertrude of Merania (1185 – 28 September 1213) was Queen of Hungary as the first wife of Andrew II from 1205 until her assassination. She was regent during her husband's absence. She was the daughter of the Bavarian Count Berthold IV of Andechs, who had been elevated to the title Duke of Merania by Emperor Frederick Barbarossa, and his wife Agnes from the Saxon House of Wettin. Gertrude's elder sister was Agnes of Merania, a famous beauty, who married King Philip II of France. Her younger sister was St. Hedwig of Silesia, wife of the Piast duke Henry I the Bearded, the later High Duke of Poland. Their brother was Otto, who succeeded their father as Duke of Merania. Her parents wanted their daughters to all make important political marriages, which would create alliances for Duke Berthold IV. Gertrude married the Árpád prince Andrew II, younger son of late King Béla III of Hungary, before 1203. Andrew thereby took sides in the conflict over the German throne, joining his father-in-law in his support of Duke Philip of Swabia, while his elder brother King Emeric of Hungary backed King Otto IV of Germany. Ambitious Gertrude exerted much political influence over her husband. It was probably she who persuaded Andrew to conspire against his brother again, but when King Emeric, who had realised that Andrew's troops outnumbered his armies, went unarmed, wearing only the crown and the sceptre, to Andrew's camp near Varasd, Andrew surrendered voluntarily on the spur of the scene. The king had his brother arrested, but Andrew managed to escape shortly afterwards. During this time, Gertrude was sent back to her father. Things improved for her, when Prince Andrew took over the government of the Hungarian kingdom upon the death of King Emeric in 1204, officially as regent for his minor nephew Ladislaus III, who nevertheless died driven in exile one year later. Gertrude was killed in 1213, by Hungarian noblemen (magnates), who were jealous over the advancement of her German relatives at court. While the king was in battle, Gertrude gave out Hungarian land as "gifts" to her favorites. According to medieval chroniclers, one third of the country was given away but the magnates got it back after the queen's death. Thus, Hungary did not prosper. During the frequent absence of her husband, the queen was regent and, as Dietrich of Apolda states, conducted the affairs of the kingdom "like a man". In 1206 her younger brother Berthold was installed as Archbishop of Kalocsa, in 1212 he was also appointed Voivode of Transylvania. While King Andrew was campaigning in Galicia, the Hungarian nobles, led by Peter, son of Töre decided to get rid of the queen and in 1213 on a hunt with Berthold and their guest Duke Leopold VI of Austria in the Pilis Mountains, she was killed. Gertrude's body was torn to pieces, her brother and Duke Leopold narrowly escaped with their lives. Due to the current political situation most of her murderers remained unpunished during the rule of Andrew II. Only Gertrude's son King Béla IV took revenge after his accession to the throne. Gertrude's tomb was of a Gothic style. Her tomb was excavated between 1967 and 1980. On Gertrude's death, Andrew married Yolanda de Courtenay. Biography*: Géza II (Hungarian: II. Géza; Croatian: Gejza II; Slovak: Gejza II; 1130 – 31 May 1162) was King of Hungary and Croatia from 1141 to 1162. He was the oldest son of Béla the Blind and his wife, Helena of Rascia. When his father died, Géza was still a child and he started ruling under the guardianship of his mother and her brother, Beloš. A pretender to the throne, Boris Kalamanos, who had already claimed Hungary during Béla the Blind's reign, temporarily captured Pressburg (now Bratislava in Slovakia) with the assistance of German mercenaries in early 1146. In retaliation, Géza, who came of age in the same year, invaded Austria and routed Henry Jasomirgott, Margrave of Austria, in the Battle of the Fischa. Although the German–Hungarian relations remained tense, no major confrontations occurred when the German crusaders marched through Hungary in June 1147. Two months later, Louis VII of France and his crusaders arrived, along with Boris Kalamanos who attempted to take advantage of the crusade to return to Hungary. 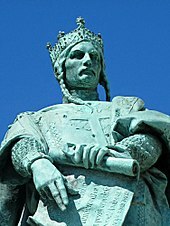 Louis VII refused to extradite Boris to Géza, but prevented the pretender from coming into contacts with his supporters in Hungary and took him to Constantinople. Géza joined the coalition that Louis VII and Roger II of Sicily formed against Conrad III of Germany and the Byzantine Emperor Manuel I Komnenos. The ancestors of the Transylvanian Saxons came to Hungary during Géza's reign. Western European knights and Muslim warriors from the Pontic steppes also settled in Hungary in this period. Géza even allowed his Muslim soldiers to take concubines. Géza intervened at least six times in the fights for Kiev on behalf of Iziaslav II of Kiev either by sending reinforcements or by personally leading his troops to the Kievan Rus' between 1148 and 1155. He also waged wars against the Byzantine Empire on behalf of his allies, including the Serbs of Rascia, but could not prevent the Byzantines from restoring their suzerainty over them. Conflicts emerged between Géza and his brothers, Stephen and Ladislaus, who fled from Hungary and settled in Emperor Manuel's court in Constantinople. Géza supported Frederick I, Holy Roman Emperor, against the Lombard League with auxiliary troops between 1158 and 1160. After the cardinals who supported Emperor Frederick I elected Victor IV pope, Géza acknowledged his legitimacy in 1160, but in a year, he changed sides and concluded a concordat with Victor IV's opponent, Pope Alexander III. Before his death, Géza organized a separate appanage duchy for his younger son, Béla. [S746] Wikipedia, online http://Wikipedia.com, https://en.wikipedia.org/wiki/Helena_of_Serbia,_Queen_of_Hungary. Biography*: Euphrosyne of Kiev (also Euphrosine of Novgorod; c. 1130 – c. 1193) was Queen consort of Hungary by marriage to King Géza II of Hungary. Euphrosyne was the first daughter of Grand Prince Mstislav I of Kiev and his second wife, Ljubava Saviditsch. In 1146, Euphrosyne married King Géza II of Hungary, who had come of age shortly before. During her husband's reign Euphrosyne did not intervene in the politics of the kingdom, but after his death on 31 May 1162, her influence strengthened over their son, King Stephen III. The young king had to struggle against his uncles Ladislaus and Stephen to save his throne, and Euphrosyne took an active part in the struggles. She persuaded King Vladislaus II of Bohemia to give military assistance to her son against the invasion of the Emperor Manuel I Komnenos. Euphrosyne's favourite son was the youngest, Duke Géza of Hungary. When King Stephen III died on 4 March 1172, she was planning to ensure his succession against her older son, Béla, who had been living in the court of the Emperor Manuel I Komnenos. However, Béla came back, and he was crowned on 13 January 1173, although the Archbishop Lukács of Esztergom denied his coronation. Shortly after, King Béla III arrested his brother, which increased the tension between Euphrosyne and her son. Duke Géza soon managed to escape, probably with Euphrosyne's help, but in 1177 he was again arrested. In 1186, Euphrosyne tried to release her younger son again, but she failed. King Béla III ordered the arrest of Euphrosyne and kept her confined in the fortress of Barancs (Serbian: Branicevo). Shortly after, Euphrosyne was set free, but she was obliged to leave the kingdom for Constantinople. From Constantinople she moved to Jerusalem where she lived as a nun in the convent of the Hospitallers, and then in the Basilian monastery of Saint Sabbas. King Stephen III of Hungary (1147 – 4 March 1172); married, firstly, Yaroslavna of Halych, no issue; married, secondly, Agnes of Austria (1154–1182), had issue. King Béla III of Hungary (1148 – 23 April 1196); married, firstly, Agnes of Antioch, had issue; married, secondly, Margaret of France, widow of Henry the Young King, no issue. Elisabeth (c. 1149 – after 1189); married Frederick of Bohemia and had issue. Géza (c. 1151 – before 1210). Odola (c. 1156 – 1199); married Sviatopluk of Bohemia. Helena (c. 1158 – 25 May 1199); married Leopold V, Duke of Austria and had issue.